Celebrating a loved one’s 50th birthday is an ideal time to get together with family and friends. 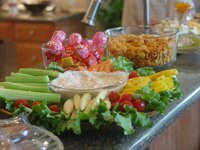 Good food and drinks are an excellent start to a classy affair of any theme. If the festivities include a pre-event reception or happy hour, you can choose appetizers that play on the use of the number 50 in some very innovative ways all while satisfying your guests. Celebrating a 50th birthday is monumental and deserves a grand affair. Plan for heavy hors d' oeuvres during your cocktail hour and ask guests to dress in cocktail attire. Offer a full spread of gourmet appetizers in bite-sized portions such as overstuffed mushroom bites, Parmesan stuffed chicken minis and double dipped hand battered shrimp passed by a server. Make this high class affair golden with a large selection of sparkling beverages including limited edition beers, wines and champagnes. Prepare gold-rimmed champagne flutes suitable for toasting the guest of honor's arrival. Make your plans for a costume party featuring either a mid-century medieval theme or based on the era in which your guest of honor was born Either way let your appetizers focus on the foods popular during the period of choice. Celebrating the birthday of someone born in the early 1960s is an ideal match for your happy hour as this was the birth period of cocktail parties. Serve buffalo wings and Swedish meatballs, all items that surfaced during this period as well as fondue and stuffed eggs. When you have planned an elaborate soiree for guests by the dozens, plan your appetizers to literally celebrate the number 50. Select 50 of your birthday honoree’s favorite snacks and layout the spreads throughout your event space for everyone to enjoy. Number each item with a note card that contains either the guest of honor’s guilty pleasure about the item or some fun fact about them representing a year of their life. Snack ideas can include everything from mini breakfast quiche and gourmet pizza bites to sushi. Plan to select items that are ideally pleasing to the guest of honor.